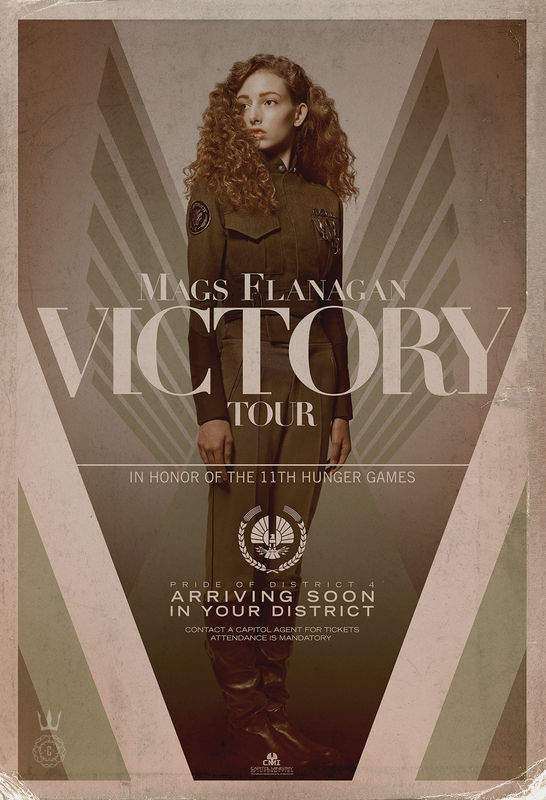 Capitol Couture and TheCapitol.pn has released victory tour posters of the 11th Victor (Mags Flanagan) and the 38th Victor (Porter Millicent Tripp). To Capitol citizens, there are none more celebrated than our victors, District citizens who have displayed heroism against the odds. So why has CapitolTV begun re-releasing former Victory Tour posters amidst a revolution? We can only imagine this is a last ditch effort to rally support around the Capitol. Whatever their reason, we at Capitol Couture are taking these posters at face value, examining the fashion and design behind these iconic posters celebrating beloved icons. There is only one victor we can imagine making a head brace look stylish—Porter Millicent Tripp from District 5. For those of you that don’t remember, Tripp earned her “halo” and a broken neck after a spinal injury she received in the Games’ final showdown. 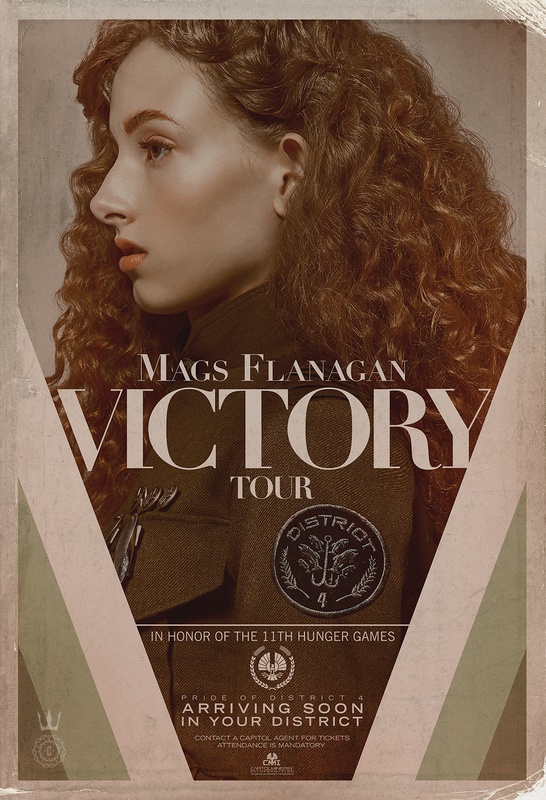 She posed for her Victory Tour poster wearing a form-fitting navy bodysuit with bright orange Capitol insignias. The complimentary colors draw you in while her defiant look makes her an unforgettable victor. We at Capitol Couture are still in awe of you, Porter. Well done indeed. CapitolTV has released a second set of Victory Tour posters from their archives, and we at Capitol Couture are in agreement; they couldn’t be any more beautiful. It’s fair to say that few of us living in Panem today have ever laid eyes on these rare and precious artifacts, with them having been sealed in the Capitol vaults for over 60 years. Mags Flanagan, immortalized here as a young woman, looks as fierce and tenacious as ever. Her triumphant win in the 11th Hunger Games made her a household name and Panem’s sweetheart for years to come. It’s incredible to think this stoic girl is the same woman that smiled so warmly and fought so valiantly alongside Katniss Everdeen in the 75th Hunger Games. Fashioning olive fatigues, Mags’ vintage look feels surprisingly on-trend with the current wave of militia attire. This, paired with minimal makeup, makes Mags look devastatingly elegant and timeless. Could Mags have been an overlooked style icon? Capitol Couture thinks so. 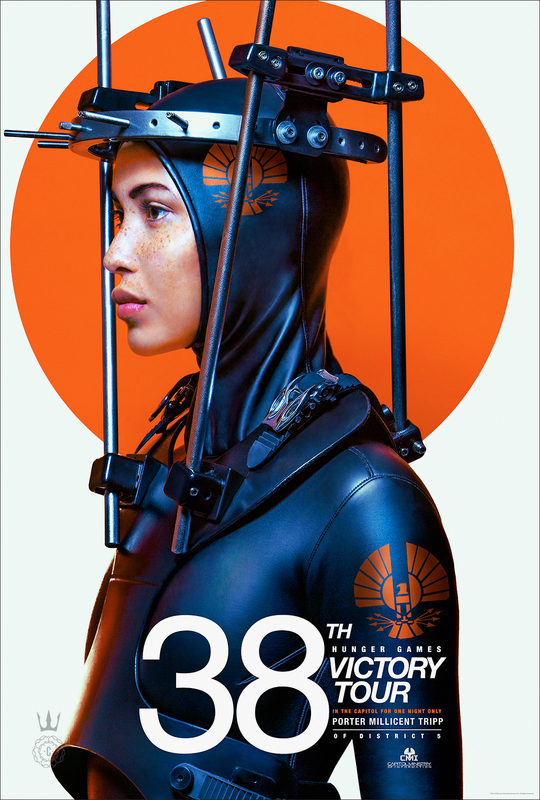 As fabulous and eye-catching as this heroic imagery is, and while Mags returned to the Games during the most recent Quarter Quell, these iconic Victory Tour posters remained under lock and key until now… perhaps saving them for greater impact when the message was needed most by The Capitol Gamemakers? Only time will tell.